This online exam management system is established for those who are awaiting an astonishing online course site. We offer one of the most efficient, effective and obvious way to use web based courses, examination and performance analysis system. We’ve realized your demand through our Business Analysis team and established this online exam management script with the help of expert technicians and designers. 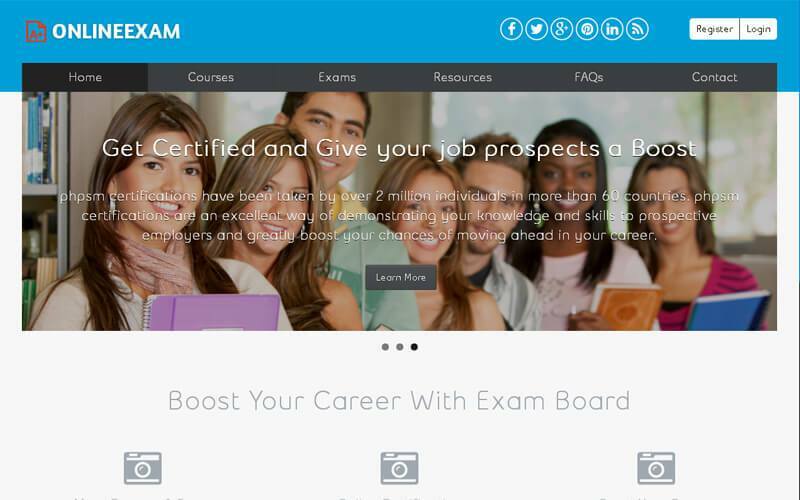 This online exam management software has some additional advantages like responsive design, user-friendly interface, Google optimization, free demo classes, various resources content, online certification facility, social media integration, free and paid exams, and courses, fully detailed result and reports, exam countdown timer, customize via course name, PayPal payment integration and quick updated course details. This online exam php script also has some distinctive feature like progressive searching as they aspire, practice for the exam and get the certificate for the respective courses. Though this is a generation which is fulfilled by learning, this script will be a ladder for your growth. You can also merge any courses like civil service, banking sector and corporate potential exams. You can have the best revenue benefits from banner advertisements, cost fixing, commissions and demo courses. You can provide online certifications to your client that make them satisfy about online learning. We are providing you with a fully open source code which is editable. Through this, you can establish the site by your own ideas by your extreme technical knowledge. I bought Online Exam Test Script 2weeks ago. Now its working in good condition upto date no issues were found on this script. I have impressed in buying this script by viewing the special features and show interest by contacting concern person. They have helped us till the installation and clear all the issues with the support team. Not only this is a great script, they support that comes along with simply amazing. Great work and very good responsibility and I would recommend the developer for future projects.